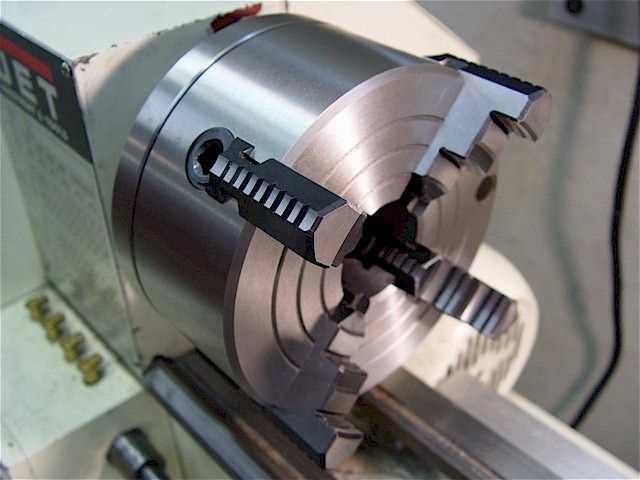 Tramming (centering) a 5C collet chuck that has 4-way built-in set screw adjustability in its adapter plate. 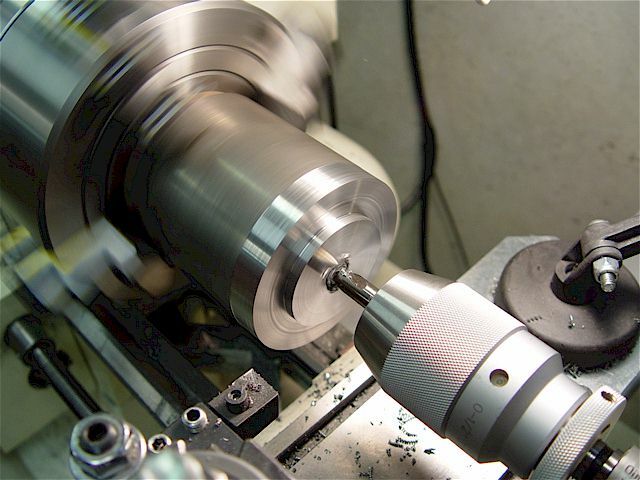 This is an important feature as this lathe has a threaded spindle nose which introduces setup variability. A Swiss-made, jeweled, Brown & Sharpe dial test indicator (0.0005" resolution) is being used to tram. Each position is stamped with a number. 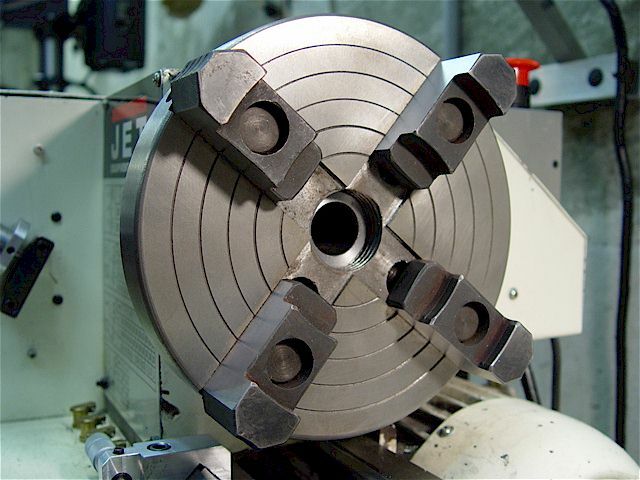 Use the 4-jaw alignment method to tram the 5C chuck. See instructions on how to set tip geometry & illustration. 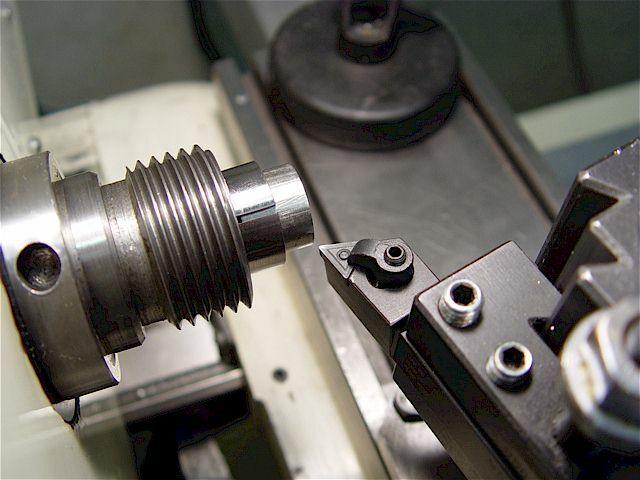 Introduction to lathe chucks. One of four adjustment set screws for tramming the 5C chuck. 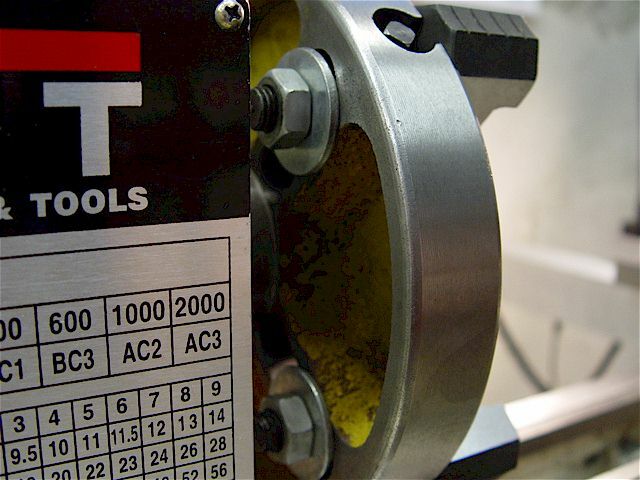 stock like jawed chucks & the total indicated runout (TIR) is low if it is a quality tool. Every chuck comes with a key. 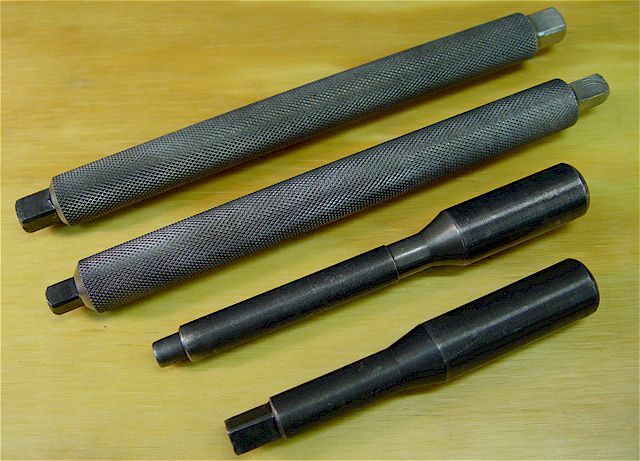 Fabricated steel Tommy bars to tighten & loosen spindle chucks. Bottom two are supplied with the Jet lathe. adapter bit into the 5C square fixture & diamond ground the sides/corners down a little until it fit. hand to avoid cross-threading. Final tightening & initial loosening should be done with the T-wrench. 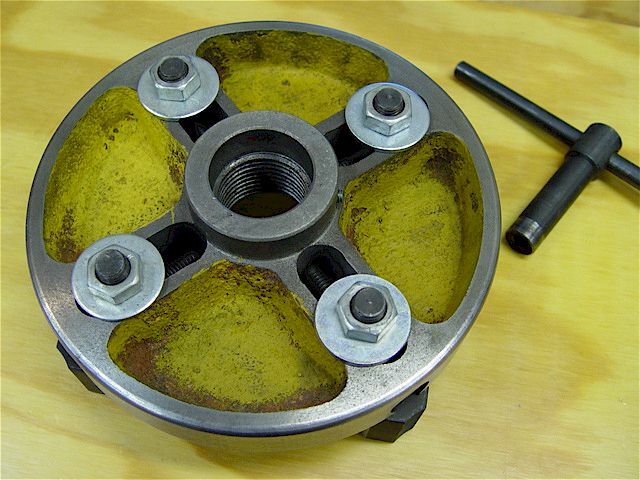 4-inch, 3-jaw 5C chuck supplied with both inside & outside hardened jaw sets & a T-wrench. 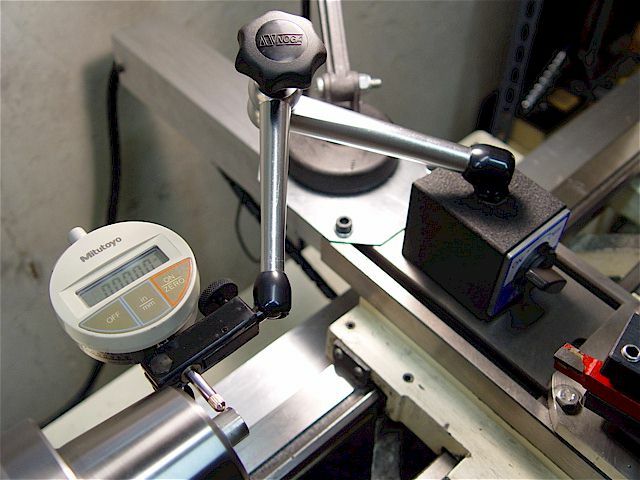 The one-piece, integral 5C back plate is strong & accurate. 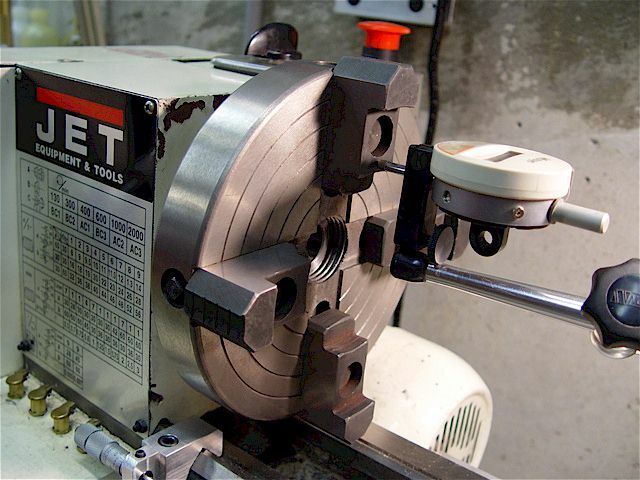 3-inch, 4-jaw, 5C mount lathe chuck & key. 4-jaw 5C specifications. 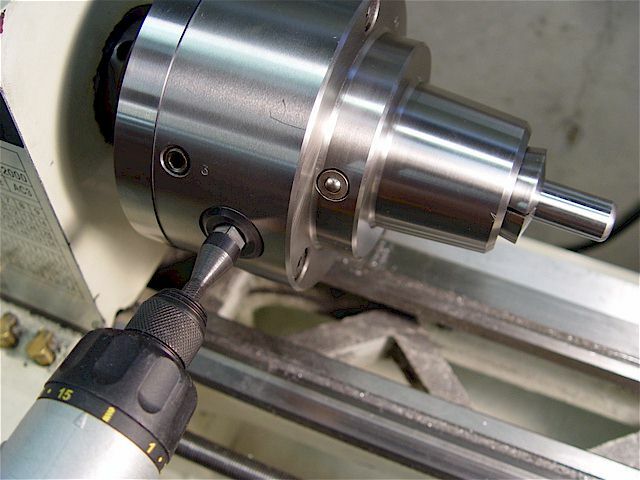 collet is an industry standard affording high precision & ready availability. 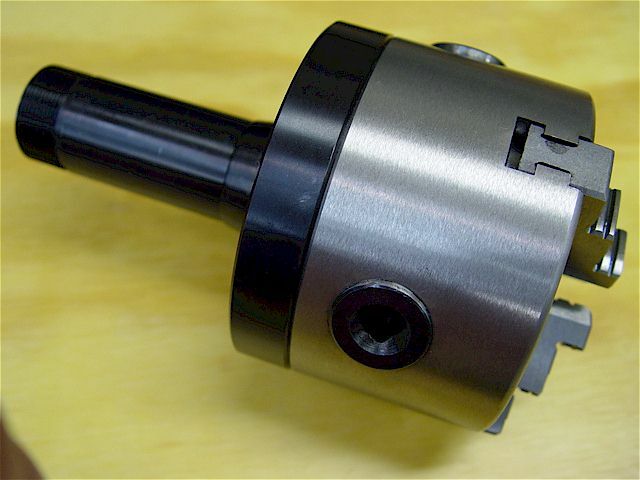 An MT3 collet holder is available. the nut's eccentric ring before screwing it onto the spindle. This ring is the collet extraction mechanism. 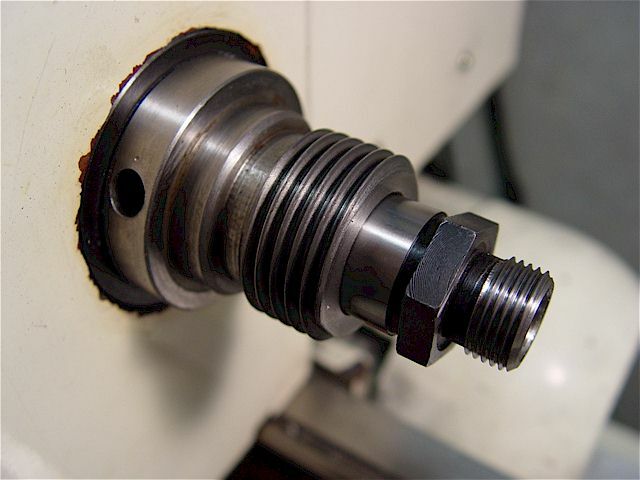 Do not tighten the nut onto an empty collet as damage could easily result. 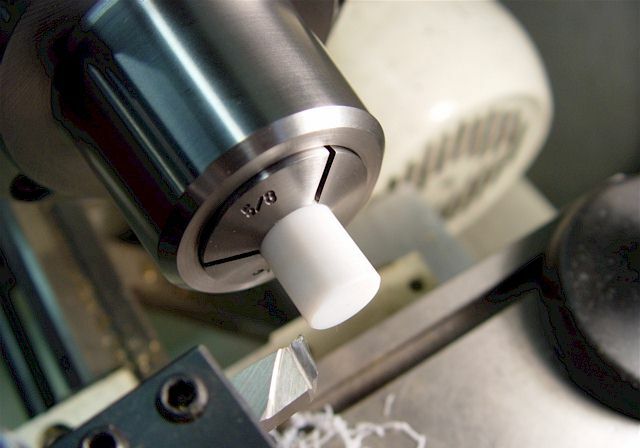 stamped with the collet's nominal size. 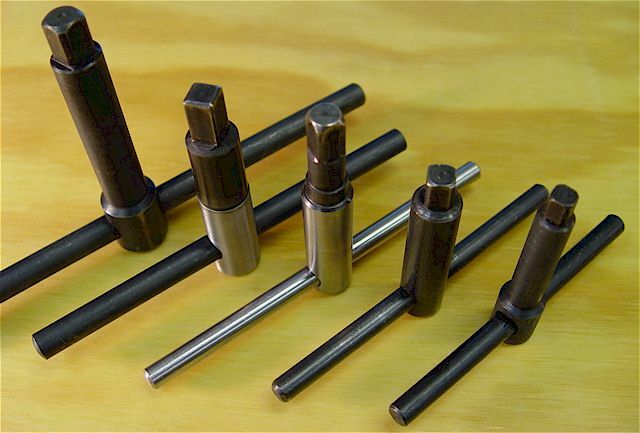 There are other types of ER-40 collet chucks, e.g., R-8 shank. 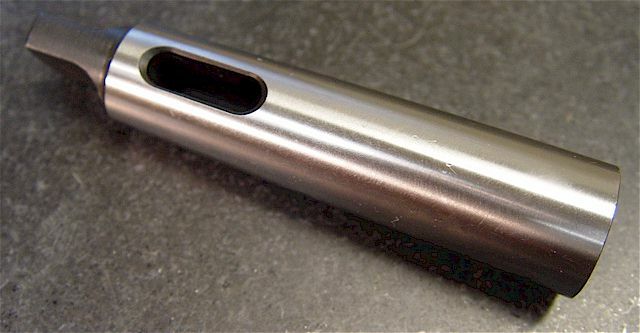 Threaded aluminum drawbar. Steel end plug machined to fit the spindle hole & a flare nut with a washer. Collet table (below) showing continuous size coverage. White sizes were the original set & green sizes were added. 1/8" 0.12500 0.12 ~ 0.16"
3/16" 0.18750 0.16 ~ 0.20"
7/32" 0.21875 0.200 ~ 0.236"
1/4" 0.25000 0.236 ~ 0.275"
5/16" 0.31250 0.275 ~ 0.316"
11/32" 0.34375 0.316 ~ 0.354"
3/8" 0.37500 0.354 ~ 0.393"
13/32" 0.40625 0.393 ~ 0.433"
7/16" 0.43750 0.433 ~ 0.472"
1/2" 0.50000 0.472 ~ 0.511"
17/32" 0.53125 0.511 ~ 0.551"
9/16" 0.56250 0.551 ~ 0.590"
5/8" 0.62500 0.590 ~ 0.629"
21/32" 0.65625 0.629 ~ 0.669"
11/16" 0.68750 0.669 ~ 0.708"
3/4" 0.75000 0.708 ~ 0.748"
25/32" 0.78125 0.748 ~ 0.787"
13/16" 0.81250 0.787 ~ 0.826"
27/32" 0.84375 0.826 ~ 0.866"
7/8" 0.87500 0.866 ~ 0.905"
15/16" 0.93750 0.905 ~ 0.944"
31/32" 0.96875 0.944 ~ 0.984"
1" 1.00000 0.984 ~ 1.020"
MT3 collet set & a 3/8-16 drawbar made from threaded steel rod. 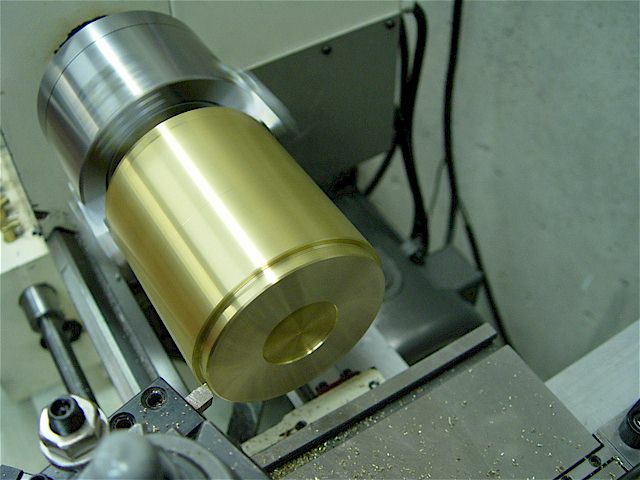 MT3 collet set from Phase2+. Drawbar made from 3/8-16 threaded stock. 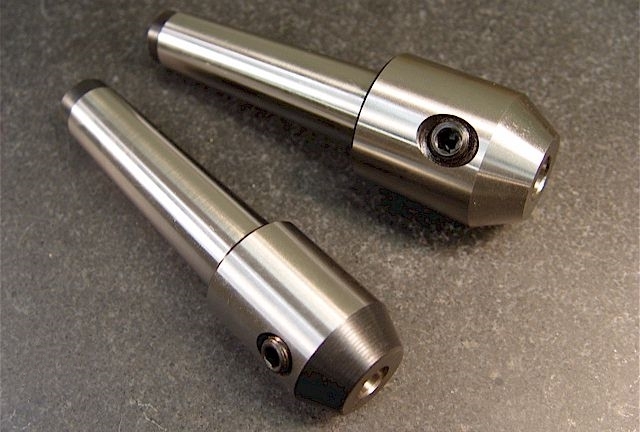 Collet sizes range from 1/8" to 3/4" by 1/16ths (no continuous size coverage). gently knocking out the bar using a hard plastic-faced mallet or brass hammer. 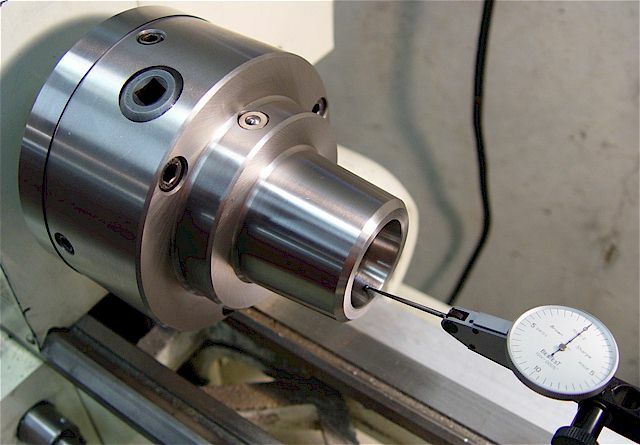 3/4" MT3 collet mounted into the Jet's spindle. 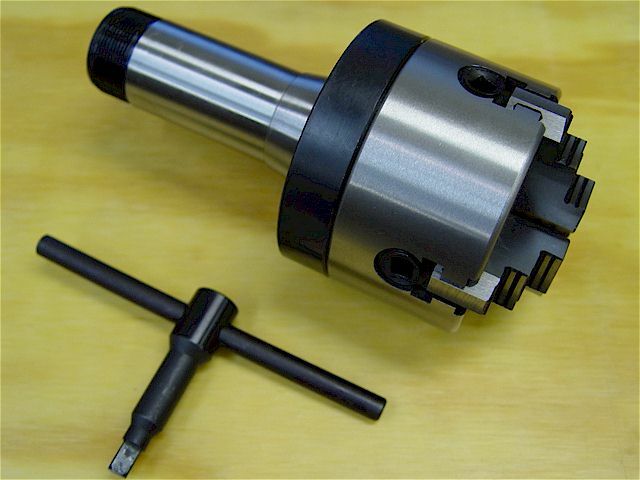 A collet in a lathe spindle is much safer & accurate than a spinning chuck with protrusions. 4" (above) manual & 6" (below), 4-jaw chucks on a standard 1-1/2-8 Jet threaded mount. 6-inch, 4-jaw instruction manual. Massive for this sized machine, it weighs over 26-lbs. 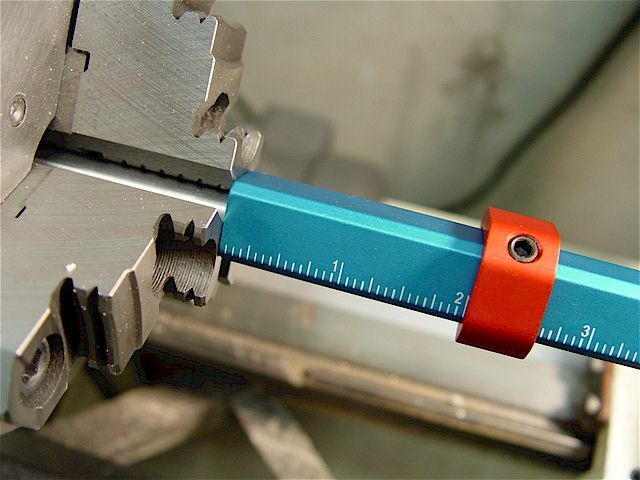 Tramming (center) the part using a digital indicator gage. 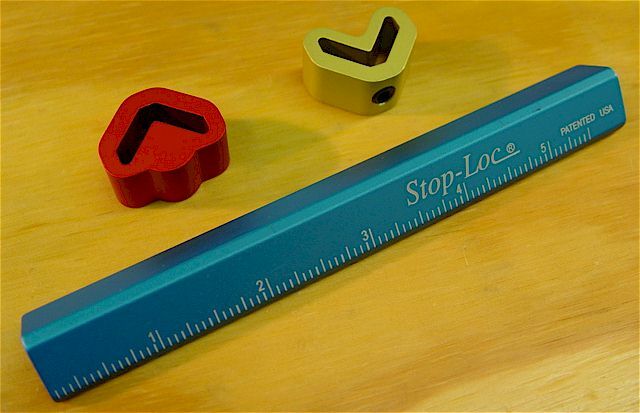 Use steel letter stamps to mark each jaw position on all chucks. I also indexed the adapter plate to the body. 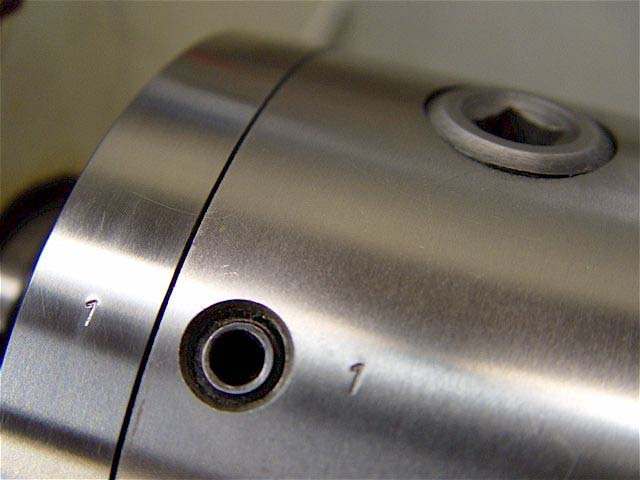 1 - After rough alignment using the chuck rings, put a dial indicator on the work piece. Then, rotate the spindle through one complete revolution noting the highest & lowest indicator readings. 2 - Continue rotating the spindle & stop exactly midway between the high & low readings, then zero the indicator. 3 - Rotate the spindle to bring jaw #1 on plunger & iteratively adjust jaws #1 & #3 to re-zero the indicator. 4 - Finally, rotate the spindle 90 deg & adjust jaws #2 & #4 to re-zero the indicator once, again. Making a new compound pivot. 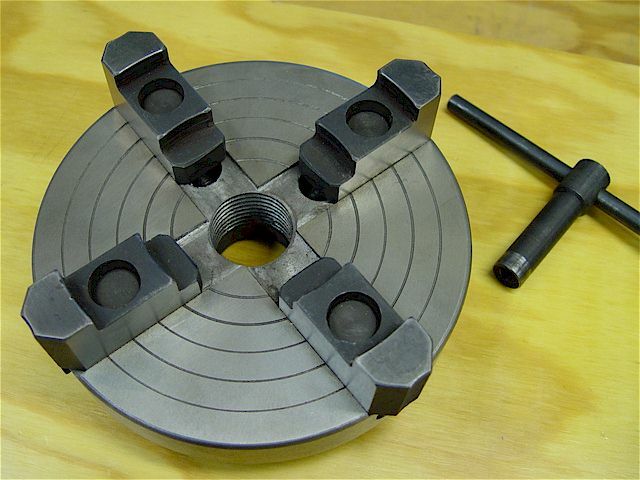 A six-inch, 4-jaw chuck from with a 1-1/2-8 threaded adapter plate. 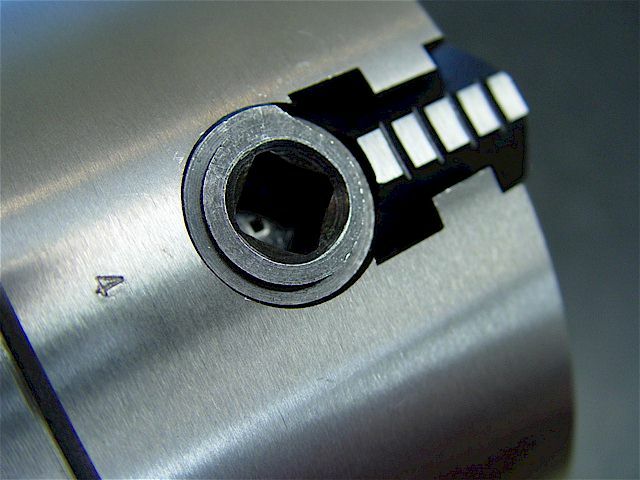 Screws right onto spindle of the Jet BD-920N. can also be mounted onto a 6" rotary table. bore of the threaded back plate was undersized & had to be bored to fit the spindle shoulder. The chuck weighs about 10-lbs. Faced the adapter plate to achieve best total indicated runout (TIR). 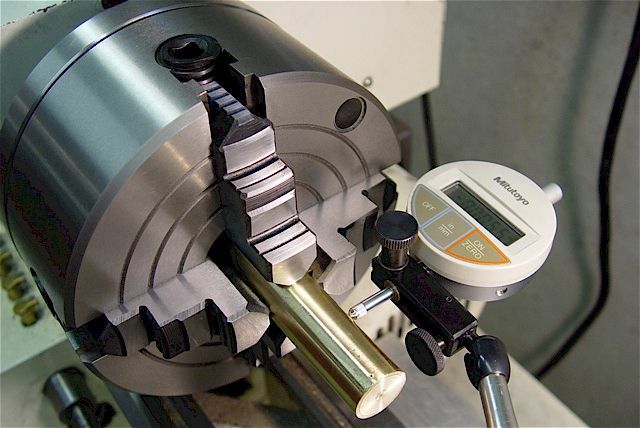 Verify your lathe is in alignment before facing a chuck adapter plate or a faceplate. 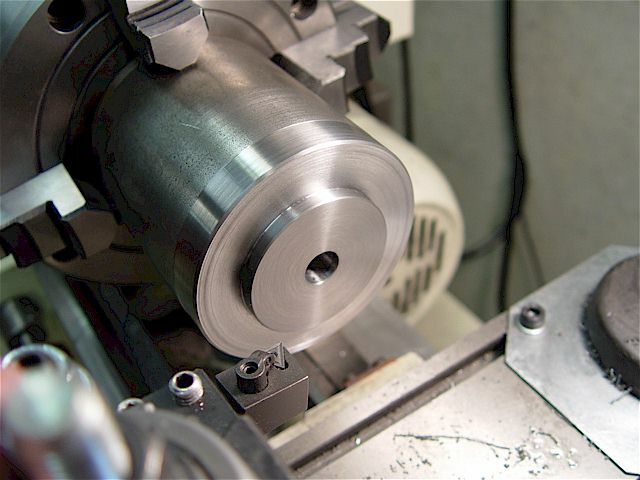 Specialized rule that can be used on lathes & mills. Stop-Loc instructions. base shown (Noga) is very easy & quick to use. Loosening a large knob makes all the joints movable. 3/8" stem or a dovetail. It has a fine adjustment feature, too. 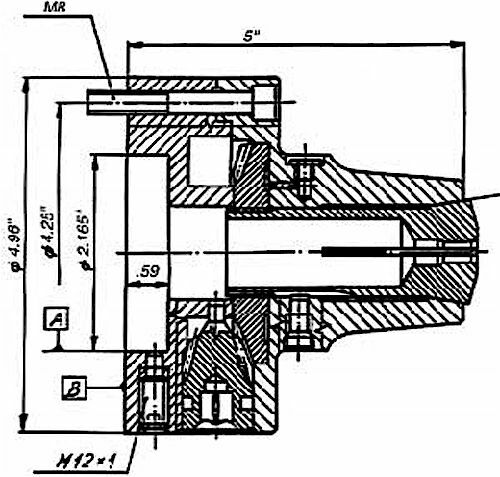 The large Jet OEM independent 4-jaw chuck is 7-3/8" in diameter. Adjustments of the jaws' rear attachment bolts are troublesome. Note the spindle safety set screw (right). 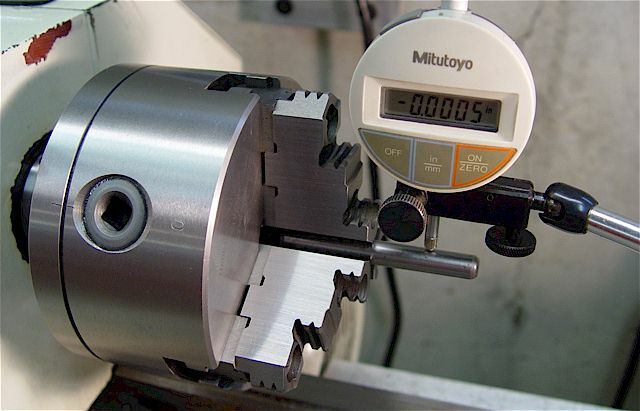 This chuck is more suited for wood applications as its accuracy is unacceptable for metal work. There are no relief cuts in the jaw corners. One could use a surface grinder to clean it up, if needed. 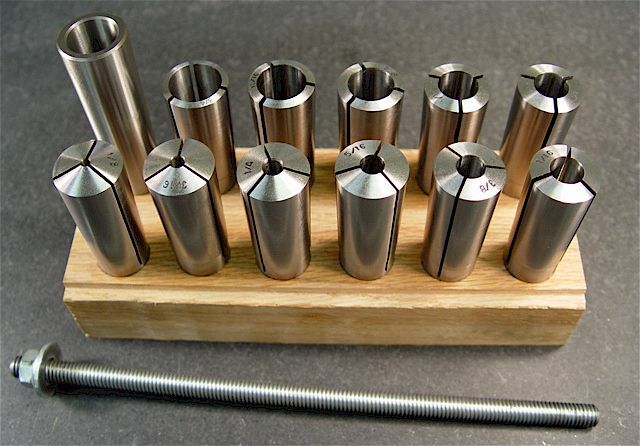 These MT3 end mill holders from Phase2+ each have a set screw that engage the end mill flat. 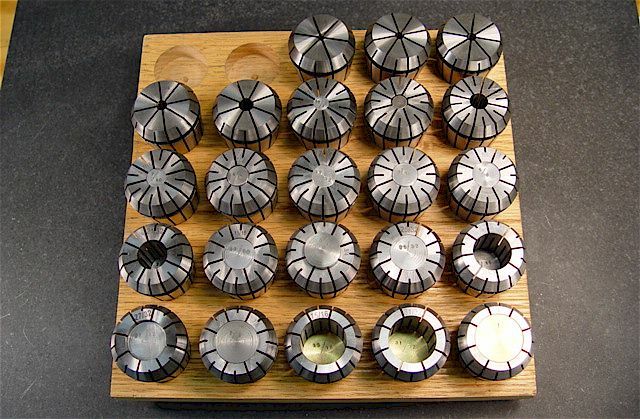 These holders are for both 3/8" & 1/2" shank end mills. 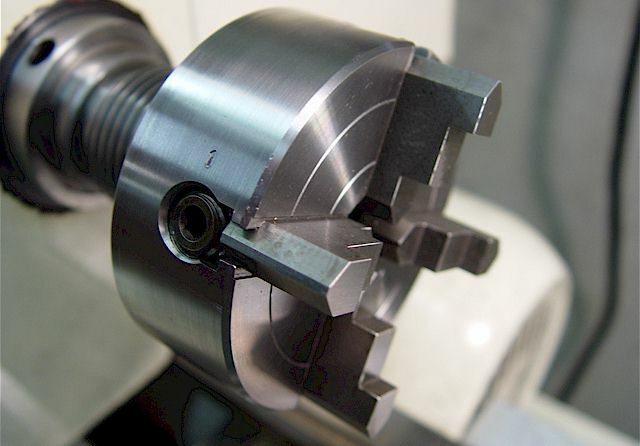 For use with the Jet BD-920N lathe spindle. slower process. It is better to mount the arbor by its threads before boring than to grip it on the outside. e.g., threaded for 10-32 to turn down screws. 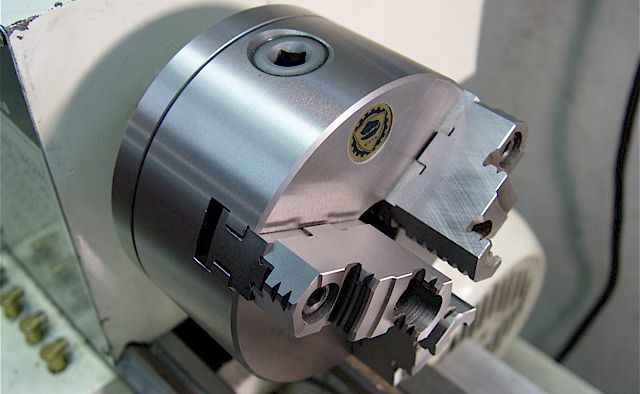 The 5C collet chuck, ER-16, or ER-40 are superior alternatives. 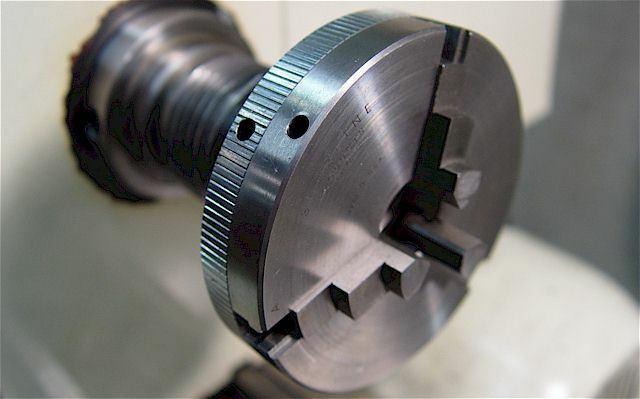 A Sherline 3.1-inch, 3-jaw chuck & a Taig 3-1/4-inch, 4-jaw chuck using a MT3 to 3/4-16 adapter. 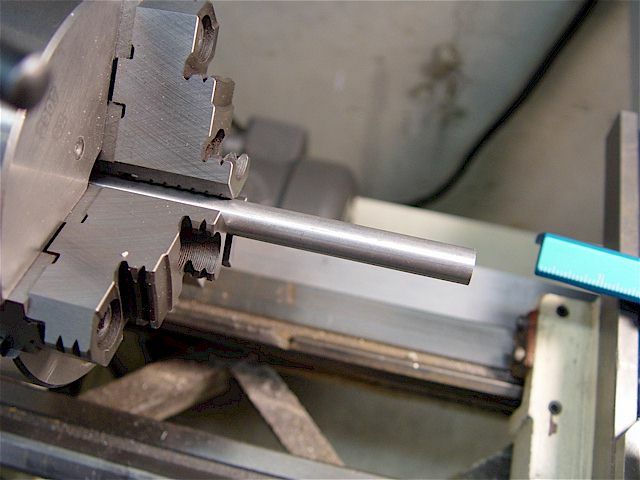 A finished end mill holder for the original-design Taig lathe/mill. Blank arbors (steel) #1132, from Taig. 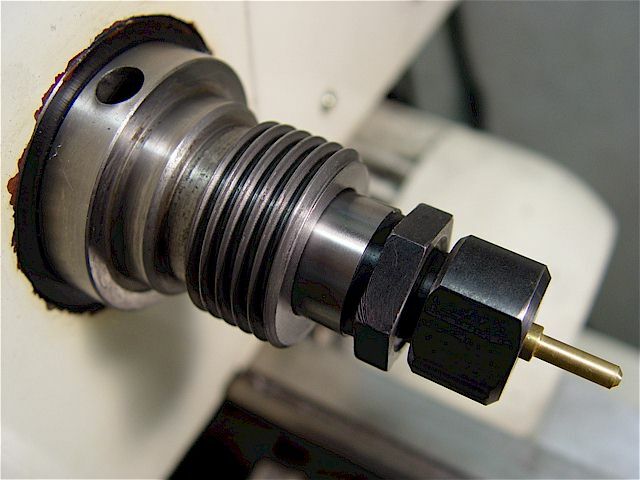 3/8"
(nor mountable) if you use the (superior) upgraded Taig mill ER-16 spindle but is still usable for the lathe. 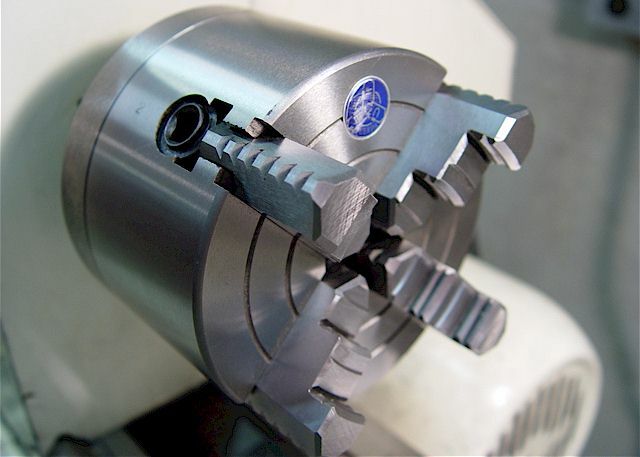 CAUTION: Large end mills easily exceed a Taig mill's capacity thus requiring small cuts. 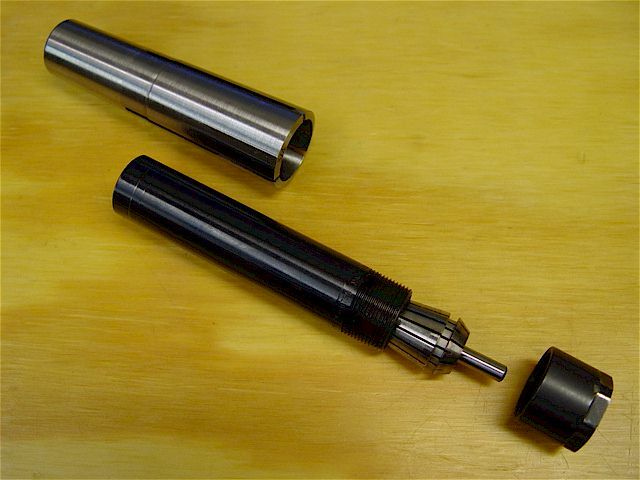 For extra small parts, combine the MT3 & stubby holder to allow use of the ER-16 collet set on the Jet lathe. 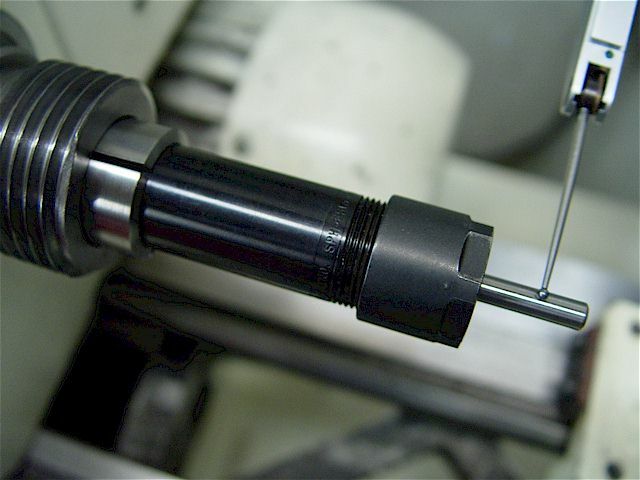 There is a left-hand set screw in the shank that controls an end mill's depth in the collet.